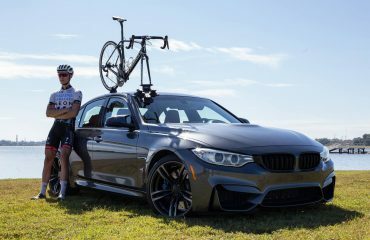 Troy, an accomplished cyclist riding for Hampton Cycles and Specialized in the Masters A Victorian Road Series recently purchased a 2016 Toyota Hilux SR5 for both work and his greatest passion, competitive cycling. 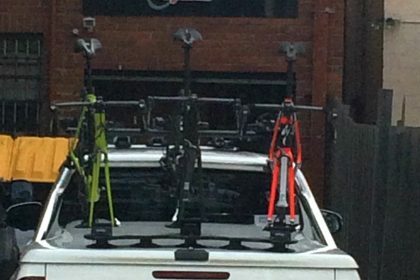 Having fitted a permanent Toyota Hilux SR5 Bike Rack 3 bike rack to the corrugated roof he needed to carry additional bikes when competing away from home. Troy contacted his good friend and our trusted customer Brett with the SeaSucker Mini Bomber. 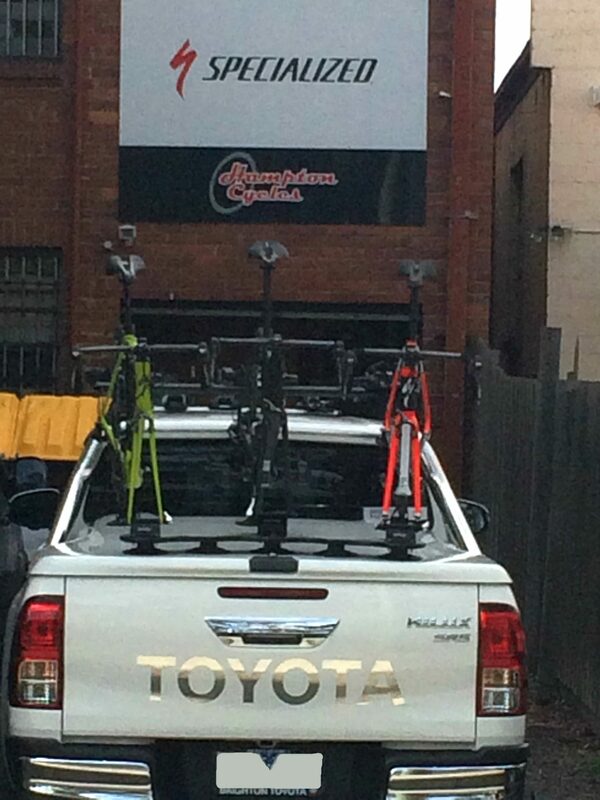 The challenge for Troy was; could a SeaSucker Bike Rack attach to the hard lid of his 2016 Toyota Hilux SR5 with the main board attached to the rear? This configuration is not one we would typically recommend for most vehicles. However, with the Toyota Hilux SR5 being a crew cab the cabin provides extra protection to the bike rack and the bikes. Brett kindly loaned his SeaSucker Mini Bomber and Troy put it to the test competing in the Mt Baw Baw Classic. With four hours of driving under his belt using Brett’s Mini Bomber Troy contacted us with the view to purchasing a SeaSucker Bomber. He brought his crew cab to our office in Cheltenham for a trial fit. We quickly determined the SeaSucker Bomber would easily fit on the rear of the hard lid. 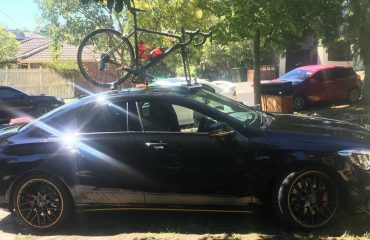 This also makes loading and unloading his bikes much easier. I’m curious, can he still open the tray lid with the bikes on? Absolutely he can open his hard lid with the bikes on and it doesn’t foul anywhere. We have set up numerous Utes and Crew Cabs with SeaSucker Bike Racks and in every case, the owner was still able to access the tray. The advantage of SeaSucker Bike racks is they can be mounted almost anywhere. The only thing to look out for with hard lids is they have pronounced corrugations or bumps in the hard lid. The vacuum mounts must make full contact in order to create the seal and generate vacuum. 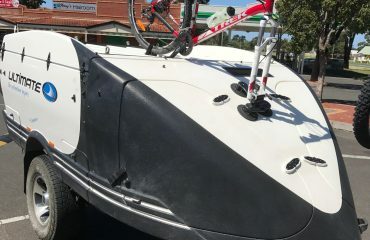 Having said this we have yet to encounter a Ute or Crew Cab with a hard lid and could not identify a suitable spot to mount a SeaSucker Bike Rack. I hope this helps. If you have any further queries please do not hesitate to contact us.